Booming Darking – “I recall the moment when my first daughter, by this time an adult living in her own home next door to mine, and I were in the midst of a raging thunderstorm of a magnitude far greater than either of us could recall from our childhoods. My first recollection of a thunderstorm dates back to 1954; I was four years old. I recall sitting wedged tightly between our hard, black vinyl sofa and the big picture window in the living room of our home in Bountiful, Utah. With one cheek of my bottom balanced wobbly on the edge of the sofa back and the other creased against the thin window ledge, I sat motionless, exhilarated and frightened at the same time. I couldn’t move a muscle or break the suction created by my open lips and hands pressing hard against the windowpane. My eyelids were glued open as my eyes grew enormous staring at the gigantic thunderstorm stretched, displaying its raw fury, as far as I could see in all directions. The horizon appeared to be the origin of this mysterious alchemy. From this giant cauldron boiled an intoxicating brew from which spewed light and sound the likes of which I had never experienced. I froze there terrified to my toes until a tug from behind jarred me away with a warning to stay clear of the window. 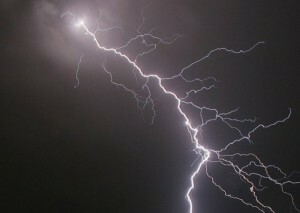 This entry was posted in Moments and tagged children, communication, lightning, moment, safety, storm, thunder. « Face painting with all the paint.